1" × 1.4" (2.6cm × 3.6cm) Folded Motion Transducer with 5.25" × 1.75" (13.3cm × 4.4cm) diaphragm. Custom air core coil and low DCR steel laminate inductors. Polyester film capacitors in series and low DF electrolytic capacitors in parallel. You won't be disappointed. Local Pickup OK. 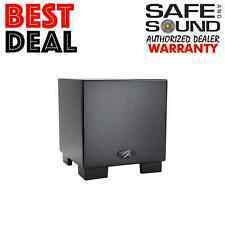 Balanced Force 212 Martin Logan Subwoofer In Gloss Black, Gently Used excellent working condition. Packed in all original packing materials. MARTIN LOGAN DYNAMO 700W SUBWOOFER, Newest "W" Version. (EACH) | REFURBISHED. Wireless Receiver. Wireless Transmitter. SWT-2 Wireless Transmitter, included. Car audio and video. Product MUST be in LIKE NEW Resalable condition. The item above is fully tested. This is a used item that may show normal signs of use such as chipped corners, marks, slight dents, or scratches. Wear will vary from item to item. This wear does not affect the working condition. OPEN BOX Martin Logan ML80I. MARTIN LOGAN ML80I (PAIR). Floor Standing Speakers. Architectural Speakers. Center Channel Speakers. Bookshelf Speakers. Outdoor Speakers. Speakers & Subwoofers. (used) Martin Logan MLT-2 10" Active Subwoofer only. Condition is Used. Bring studio-quality sound to your living room with thispair of Martin Logan ElectroMotion ESL 8" floor speakers. ElectroMotion is often regarded by audiophiles as the premier speaker option in its class. Five Star Rated Sub, One of the best Subs Under $300! New ListingMartin Logan Balanced Force 212 Subwofer, Brand New In Box. Martin Logan Balanced Force 212 Subwofer, Brand New In Box.. Condition is New. Shipped with FedEx Ground or FedEx Home Delivery. Martin Logan Motion Vision X. I’ve only had it for about 5 months, but must sell. Cosmetically and functionally it’s in excellent shape. Remote and power supply are included, along with the wall mount bracket. I will also include an optical cable. It will be professionally boxed and shipped via UPS or Fedex. Please not that I may need to charge more for shipping if the actual amount for your area turns out to be significantly higher than the listed shipping cost. The speaker was priced over $1,500 when I purchased it recently. MARTIN LOGAN MOTION 8 CENTER SPEAKER (EACH) | REFURBISHED. Center Channel Speakers. Floor Standing Speakers. Two channel hifi. Trade in used products. Motion Transducer with 5.25 x 1.75”. Single Din Stereo. ---MARTIN LOGAN BRAND. SUBWOOFER ONLY FROM MODEL DYNAMO. ---PART NUMBERS D10DSW4. D-0402006. ---100 watt. 4 ohms. 10" SUBWOOFER. TESTED AND WORKS. MartinLogan ML-60 6.5" 2-way/80-watt ceiling speakers $300-pair list ! WE ARE ANAUTHORIZED MARTINLOGAN DEALER! MartinLogan Architectural Speakers. They are the perfect solution when you want a great sounding but unobtrusive sound system without the cable clutter that cabinet speakers often bring. Tweeter Folded Motion Transducer. Woofer Size 8. Woofer Composition Aluminum. Woofer Surround Rubber. Enclosure Type In-ceiling. Power Range (Watts) 20-300. The subwoofer was never used and in excellent condition. Opened only to inspect. Look no further. REFURBISHED Martin Logan Motion 15 Bookshelf Speaker high-gloss BLACK MOTION15. Bookshelf Speakers. MARTIN LOGAN MOTION 15 (EACH) | REFURBISHED | BLACK. The High-Performance Motion 15 bookshelf features an advanced resolution Folded Motion™ tweeter, a. Brand new Martin Logan 15 speaker. Just got the speaker for my home theater but decided to upgrade to higher end speakers. Its past the return policy at Best Buy so I must sell here. Photo is of the actual item.Shipping is the US 48 contiguous states only (the "lower 48"). I will ship with ground shipping. Check my past feedback and be confident that I am an honest seller! The result is a smooth, refined sound with stunning dynamic range and jaw-dropping clarity. WE ARE ANAUTHORIZED MARTINLOGAN DEALER! The MartinLogan Motion Series. What makes the Motion Series sound so amazing?. REFURBISHED MARTIN LOGAN MOTION 8i CENTER SPEAKER (EACH). MARTIN LOGAN MOTION 8i CENTER SPEAKER | EACH | REFURBISHED. Flexible installation options allow table top or on-wall installation of all four speakers. *REFURBISHED* Martin Logan ELECTROMOTION EM-IW in-wall speaker EMIW EM IW . MARTIN LOGAN ELECTROMOTION EM-IW (EACH) REFURBISHED. A family is the most natural team. 6.5” (16.5cm) aluminum cone with cast aluminum basket. Depth Required Behind Wall Surface. Projection From Wall Surface. The result is a smooth, refined sound with stunning dynamic range and jaw-dropping clarity. Folded Motion tweeters and woofers are seamlessly blended with an advanced topology crossover network featuring polypropylene and low-DF electrolytic capacitors, custom wound inductors, and thermal and current protection. The ElectroMotion ESL (EM-ESL) represents a brave new direction for electrostatic loudspeaker design. The new ESL, however, boasts 40 percent more radiating surface, a superbly integrated and authoritative bass performance, and a sensitivity rated at 91dB. MartinLogan Dynamo 500 Powered Subwoofer (Black) Used Mint Condition!!! More details on the MartinLogan Dynamo 500. Low-Distortion 10" Woofer: The Dynamo 500's high-resolution front-firing driver combines a 10" polypropylene cone with a high-intensity magnet structure to achieve huge excursion and output capability without sacrificing detail. These center channel speakers are in great condition showing minimal wear overall. An Advanced Thin Film driver, long-excursion low-mass woofers, and sophisticated crossover engineering combine to produce sound with a lifelike clarity and openness. This is a Single Martin Logan MLT-1 Sub Speakers Black. Hawaii and. LC-ROGER-4081 (25/lb-15x14x12) ER. Salesbaron is in Los Angeles, 90039. WE ARE ANAUTHORIZED MARTINLOGAN DEALER! To plumb the depths of the music and movie experience, bass afficionados can add a high-performance MartinLogan subwoofer. By eliminating cone flexure, even at long voice-coil excursions, Dynamo 500's advanced-technology bass driver achieves the very low distortion necessary for proper blending with MartinLogan Folded Motion™ and electrostatic speakers. MARTIN LOGAN MOTION 50XT BLACK (EACH) |OPEN BOX. Center Channel Speakers. Floor Standing Speakers. Two channel hifi. Trade in used products. Folded Motion XT Transducer with 4.5” x 2.75”. Car audio and video. MartinLogan - Refurbished DYNAMO 500 - 10" 120W Powered Subwoofer - Black Ash. Complete your audio setup with this Martin Logan Dynamo subwoofer. This Martin Logan Dynamo subwoofer includes a built-in amplifier that provides a continuous 120W of power. OPEN BOX Martin Logan Motion 40 Speaker EACH. MARTIN LOGAN MOTION 40 FLOOR STANDING SPEAKER GLOSS BLACK | OPEN BOX | SOLD AS EACH. The elegant Motion 40 speaker features our advanced resolution Folded Motion™ tweeter, a 5-1/2” aluminum cone midrange and two 6-1/2” aluminum cone bass woofers. 5 out of 5 stars - *OPEN BOX* Martin Logan Motion 40 Speaker gloss piano black MOTION40 EACH . 6 product ratings6 product ratings - *OPEN BOX* Martin Logan Motion 40 Speaker gloss piano black MOTION40 EACH . This is a great subwoofer. It is in really terrific shape. I just upgraded my equipment so I am selling this subwoofer. MartinLogan ML-80 8" 2-way/120-watt ceiling speakers $400-pair list ! WE ARE ANAUTHORIZED MARTINLOGAN DEALER! It will excel in front, center, or surround duties and also admirably suits dedicated two-channel applications. MartinLogan Architectural Speakers. They are the perfect solution when you want a great sounding but unobtrusive sound system without the cable clutter that cabinet speakers often bring. WE ARE ANAUTHORIZED MARTINLOGAN DEALER! The result is a smooth, refined sound with stunning dynamic range and jaw-dropping clarity. 1" x 1.4" Folded Motion tweeter. 3-1/2" poly cone woofer with rigid dust cap. Martin Logan ElectroMotion IW (Ea.). Think of a tune, then play it - instantly. Apple's AirPlay wirelessly streams high-quality lossless audio or MP3s from iPhone®, iPad® or iPod touch® straight to your Cadence soundbar. And from iTunes on a Mac or PC too. REFURBISHED Martin Logan Dynamo 800X. MARTIN LOGAN DYNAMO 800X SUBWOOFER (EACH) | REFURBISHED. Dynamo 800X Product Highlights. Dynamo 1100X and 1600X go one step further by adding both XLR and RCA inputs for LFE connection. Dynamo 700W Specifications includes SWT-2 MartinLogan Subwoofer Wireless Transmitter. Built-in receiver and included SWT-2 transmitter. » Subs Per Transmitter. Wireless Capability. » Wireless Band. » Maximum Wireless Range. 1” x 1.4” (2.6cm x 3.6cm) Folded Motion. 5.25” (13.3cm) aluminum cone with cast basket. Rigid structured dust cap to reduce cone break-up modes. What you need to know – This product may have a serial number that uniquely identifies the item. Experience rich, robust sound with the MartinLogan Motion 50XT center-channel speaker that features dual 6-1/2" aluminum-cone woofers and a Folded Motion XT tweeter for dynamic audio. The Motion 50XT is often regarded by audiophiles as the premier speaker option in its center channel class. Martin Logan Motion 15 Gloss Black / pair *MINT* L@@K! MartinLogan has been manufacturing and selling woofers, speakers, and other pieces of audio equipment since the late 1970s, and in that time, they have developed a variety of home theater sound systems that deliver both crisp treble and booming bass. The speakers are constructed using electrostatic and thin film loudspeaker technology, making them both versatile and durable even under excessive strain. When paired up with the right amplifier, MartinLogan equipment provides an amazing audio experience. What are the main features of MartinLogan speakers? The two main features of MartinLogan audio equipment are electrostatic loudspeaker and thin film loudspeaker technology. To start with the former, these speakers are characterized by having the membrane suspended in an electric field that gets stimulated by the signals being sent from the amplifier. The advantages of using this design is that it makes it so that the speakers can achieve much deeper levels of distortion than conventional cone drivers. They are lightweight and exhibit a great frequency response. Thin film technology involves coating key components in a very thin layer of material that both strengthens and protects them. This is applied to not only the cone and membrane but also electronic parts. MartinLogan equipment also has wireless connectivity and sleek cabinet designs that will work with any decor. The Monolith series is the first full line of home theater entertainment to roll off the production line and features tall cabinets with woofers, mids, and tweeters installed. Subsequent redesigns of the Monolith series include Aerius, SL3, Quest, and Cinema. The Statement e2 generation was their next big leap forward with an 1,800-pound audio system featuring multiple towers, including subwoofer stacks. This line inspired the Prodigy series, which further spawned the Odyssey, Ascent, and Aeon series. There are many different subwoofer lines, including Descent i, Depth i, Grotto, Abyss, and Dynamo, all of which feature servo-control and BalancedForce technology. What are some tips for speaker maintenance? Dust regularly or put them in an area free of dust and particles. Do not use liquid cleaners since they can damage components. Keep them away from all magnetic sources. Keep static electricity at a minimum. Content provided for informational purposes only. eBay is not affiliated with or endorsed by MartinLogan.